First and foremost, I’m so sorry for the nearly three-week hiatus I took from posting on here—life just happens, y’know? My schedule for the past month has been jam-packed with fun activities and adventures: I joined my family on vacation in Hilton Head Island, did a bar crawl in Hoboken with my college alumni group, tried new brunch spots with friends, took myself on solo dates to Rockaway Beach and Central Park, and last weekend visited family friends in Melbourne, Florida. Oh and this Friday I’m going home to Cleveland for five days! So now that my mind, body, soul and creativity are refreshed, I’m ready to jump back into blogging! 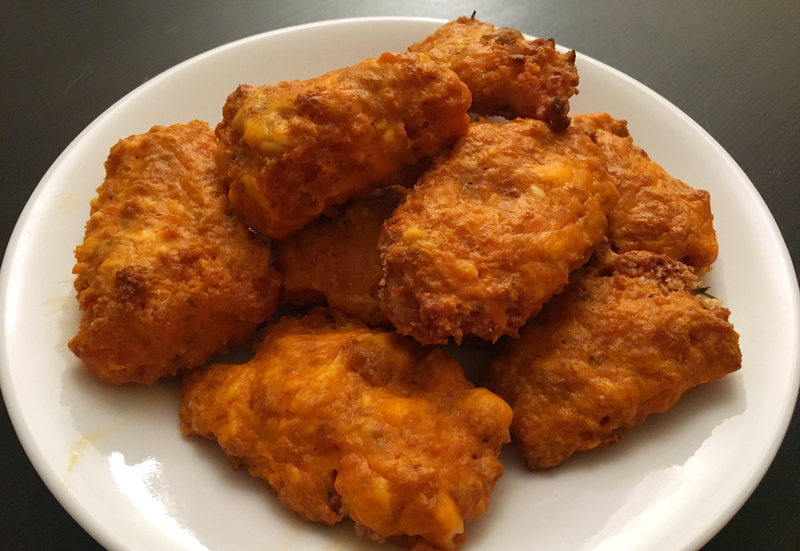 And what better way to return than with a recipe for wings? And not just wings, but no-guilt, boneless wings. I mean, it is #WingWednesday, after all…. I made these last night for the first time, and they turned out spectacular. The best part (other than devouring them, of course) was that I already had all the ingredients. Actually, the only item that was missing was bleu cheese (or ranch), but it was storming like crazy with lightning every 10 seconds. I survived without it; if you’re less lazy than I am and would have made the trek, I salute you! Btw, if buffalo isn’t your thing, you can absolutely sub barbecue sauce, teriyaki sauce or whatever you fancy. I didn’t perfectly measure out ingredients, so you may need to add a little as you go, depending on how many wings you want to make. Preheat oven to 375℉. Line a baking sheet with foil and coat with cooking spray. Cut chicken breasts into 2-inch pieces. In a bowl, combine well the salt, pepper, garlic powder and flour. In a bowl, whisk together the eggs and water. In a dish, crush Rice Krispies into breadcrumb consistency (I take a handful and squeeze it, but you could also use the back of a utensil), and mix well with panko. Now the fun part! 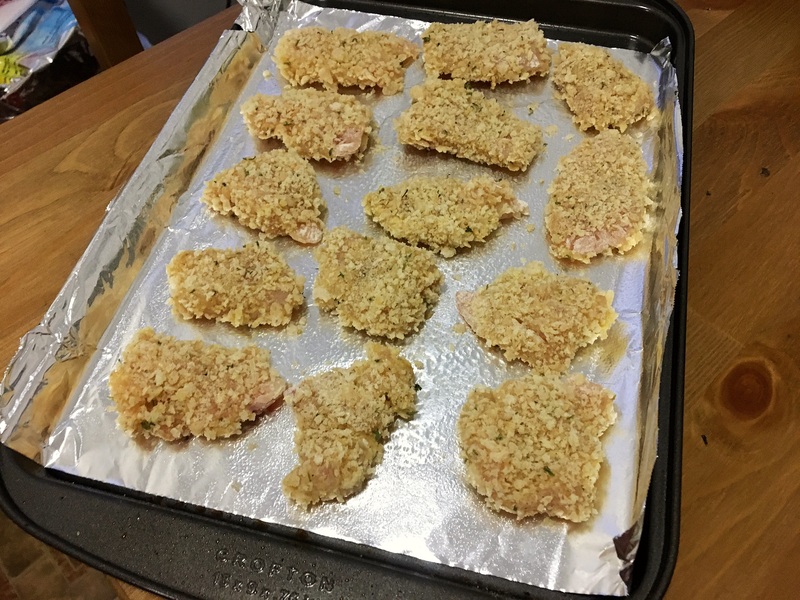 Take a piece of chicken, coat it in flour (press it down on all sides to make sure it’s fully covered) and lightly tap off excess; submerge it quickly in egg wash; coat it with panko mixture (again, important to press down all over, so you get that yummy, crunchy exterior). Place on baking sheet. [*TIP: use one hand to dip/coat and the other to press. Keep a couple sheets of paper towel nearby to wipe off messy fingers, so you don’t have to constantly rinse them]. Bake wings for 25 minutes. After 25 minutes, turn broiler on high for at least 5 minutes until breading is golden brown and crispy. In a small saucepan on low heat, melt butter and cream cheese together, stirring until combined. I know it’s tempting to raise the heat to expedite the melting process, but don’t. Add hot sauce and stir again until fully incorporated. 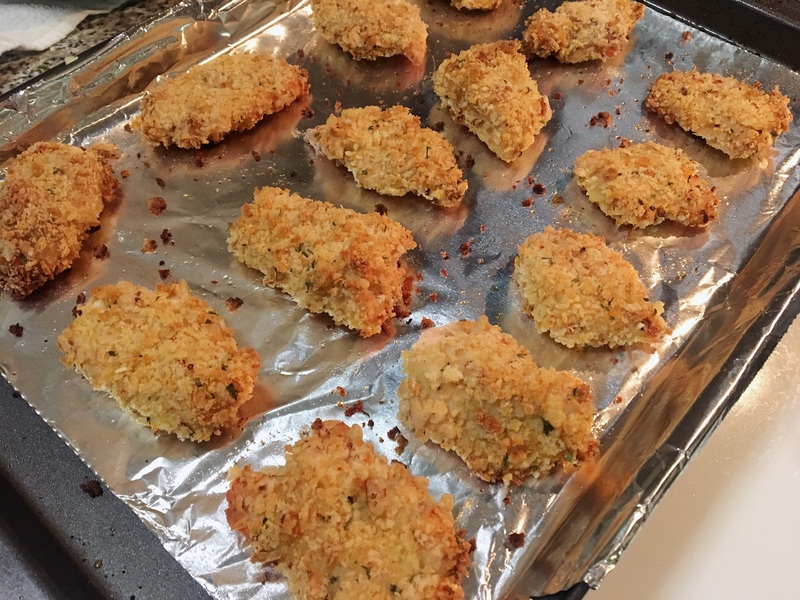 After all chicken is coated, place wire rack on top of your baking sheet. Place chicken back on, and return to oven for another 5 to 7 minutes under broiler on high. This is where the magic happens!! For my Bachelorette fans out there, I tried to get Jason Tartick’s stamp of approval (quick backstory for non-fans, Jason took Bachelorette Becca to a buffalo wing-eating contest on his hometown date in Buffalo), but I have yet to hear from him as I write this. Maybe it’s a good thing he didn’t reply yet, because those wings I made are long gone. What’s your favorite wing flavor? Let me know in the comments!